Like most homes, the kitchen is a focal point in all our nurseries and we encourage you to acquaint yourselves with our kitchen staff. One of the cornerstones of the day at Rascals is the delivery of fresh, home cooked snacks and meals. We design our menu’s with low salt, low sugar diet plans, with plenty of fresh fruit and vegetables. You will never find a baked bean, fish finger, burger or chip’s in our kitchen. We have a 4 week menu cycle in all nurseries, offering meals designed to be both healthy but interesting. Our professional chefs and cooks prepare all food with allergies, intolerances, parental and religious preferences in mind. Our allergy management programme will be of particular interest to parents of children with food allergies. 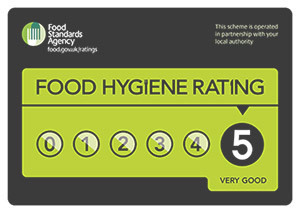 All Rascals kitchens have been awarded the top 5 Star “scores on the doors” award.